I have been looking at Taifun Boot after finding version 1.7 that worked on ROM03 and decided I would post something about for anyone that hasn’t come across this nice little utility. 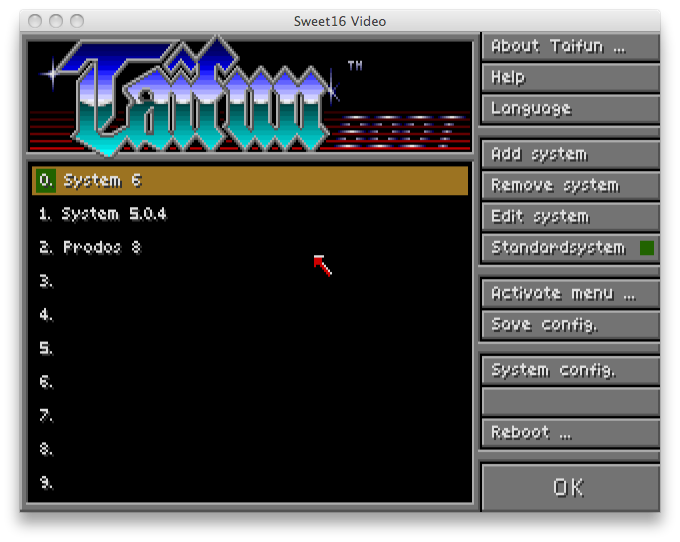 TaifunBoot is a OS selection tool that installs on to your boot volume and then allows you to config booting into different OS versions (supports GS/OS, ProDOS 16 and 8 ) via a menu system or via press of key. It also provides the ability to change the system configuration of GS/OS. This means you can then enable or disable CDA, NDA, CDevs, Inits, Drivers and FSTs. 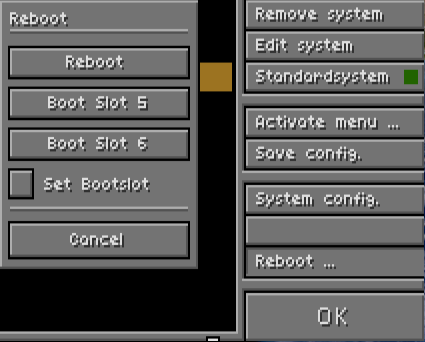 Its final feature is the ability to boot off Slot 5 and 6 via the menu if need be rather than having to configure it via control panel. My test system was Sweet16 with ROM03 and GS/OS 6.0.1 with ProBoot installed. Installation was quick and all you have to do is run the “Install.TFB” file and select the boot volume you want TB to be installed to. The only issue i had here was having TCP/IP connected as the system would just prompt to say that TCP/IP won’t work under Prodos 8 and I couldn’t go any further. The work around was just to disconnect TCP/IP before installing TB. Once the system rebooted TB will automatically prompt the menu. The initial configuration has the first entry (0) pre filled in with the default OS that was installed when you installed TB. On installation TB will copy itself to the boot volume and rename the standard “PRODOS” to “PRODOS.” and put itself as “PRODOS”. This means to simply remove TB you just need to reverse that. To install a new OS you just need to copy over the necesssary system files to the boot volume (making sure they are renamed accordingly). 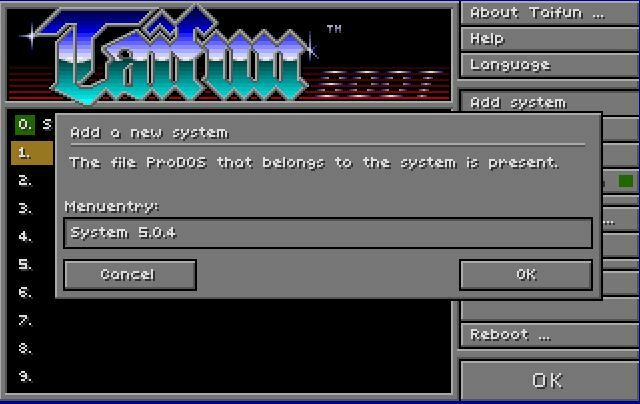 I decided to create a System 5.0.4 entry and copied over PRODOS, SYSTEM folder and ICONS folders to my boot volume. Before I copied them I labled them for the 2nd menu item which means they were labeled as PRODOS.1, SYSTEM.1 and ICONS.1. Subsequent OS installs will follow the same pattern until .9 which is the maximum number that is supported. Once you have setup your menus you don’t have to always be prompted with the TaifunBoot menu. There is an option under “Activate Menu” called “Activate always”. If this is unticked then the Menu won’t be displayed but just a boot message. This will wait the designated time (3 secs is default) for a specific key press. At this point if you don’t press anything it will just boot into the StandardSystem (again this is configurable). If you press one of the number keys it will boot the corresponding OS and finally you can press Ctrl,Shift, Option or Open Apple to bring up the Menu itself. For GS/OS you can also configure what gets loaded or not loaded when booting the OS by configuring the “System Config” option. Though this seems flakey on the 1.7 ROM03 version i tried. 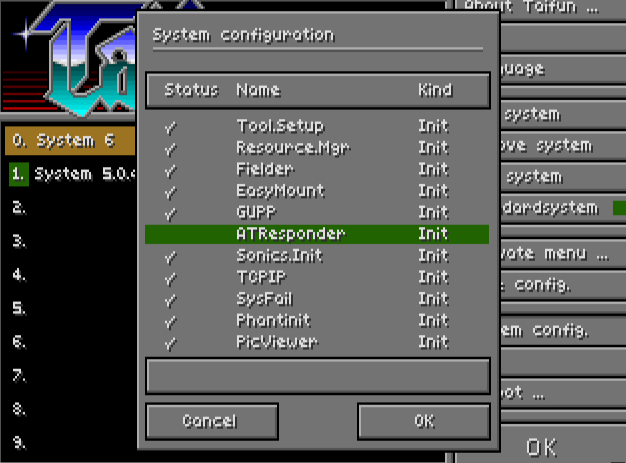 In an emulator I was not able to untick/tick anything but on a real GS i was able to, but had to click it a few times. It seems on a ROM01 this isn’t a problem with the 1.7 version or the 1.8. There does seem to be several versions around. 1.8 doesn’t work with ROM03 properly and there are versions of 1.7 that don’t work either, so you might need to have a play till you find the right one. If anyone wants the version i have been using on a ROM03 drop me an email and will send it on. I also have 1.7 for ROM01. 1.8 is available from Ninjaforce’s website (http://www.ninjaforce.com/), but it doesn’t contain any documentation. I have emailed them to see if a 1.8 version is availablet that works correctly with the ROM03, if they come back with a new version I will post it. You are currently browsing the Drew ][ blog archives for May, 2010.